Growing up, I was always told I have a “sensitive stomach.” Digestion issues and I were never friends. I suffered from constant stomach aches, nausea, headaches, etc. I decided to find out what is causing so much distress on my digestion. Awhile back, I took Everlywell’s food sensitivity kit. I found out I was sensitive to a lot of foods. Some foods were oats, dairy, gluten, apples, peaches, chicken, pineapple, basil, among many others. I was told due to the sensitivities I had, a paleo lifestyle could be the best option for my stomach issues. Food sensitivities present themselves in many ways: nausea, migraines, anxiety, ezcema, IBS, and others. So a paleo lifestyle is the way I chose. With these changes in my diet, I cried a little when I thought I would have to say goodbye to my sweet tooth. That is, until I found Sweet Laurel’s Bakery’s cookbook. There’s so many great options for sweets that all are grain free, dairy free and refined sugar free. It’s definitely the best cookbook I’ve purchased. This whole new way of eating is a learning curve but I’m excited to learn along the way! Preheat oven to 350 degrees F. Line a baking sheet with parchment paper. Line muffin cups with paper liners. Make the Struesel: In a small bowl, whisk together the flour, oil and maple syrup until the mixture comes together. 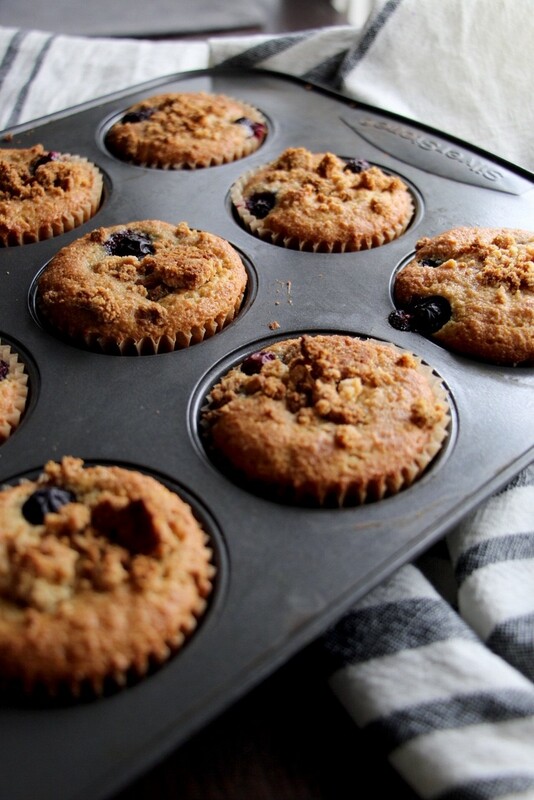 Crumble onto the baking sheet and bake for 20 minutes or until the streusel begins to crisp. Remove and set aside. Keep the oven at 350. Make the Muffins: In a large bowl, whisky together the flour, baking soda and salt. In a separate bowl, combine the eggs, coconut oil, maple syrup, lemon zest, lemon juice and vanilla. A little at a time, add the dry ingredients into the wet ingredients. Stir until a smooth batter forms. Divide the batter among the muffin cups, filling 3/4 of each cup. Top each muffing with blueberries and swirl them into the batter with a spoon. 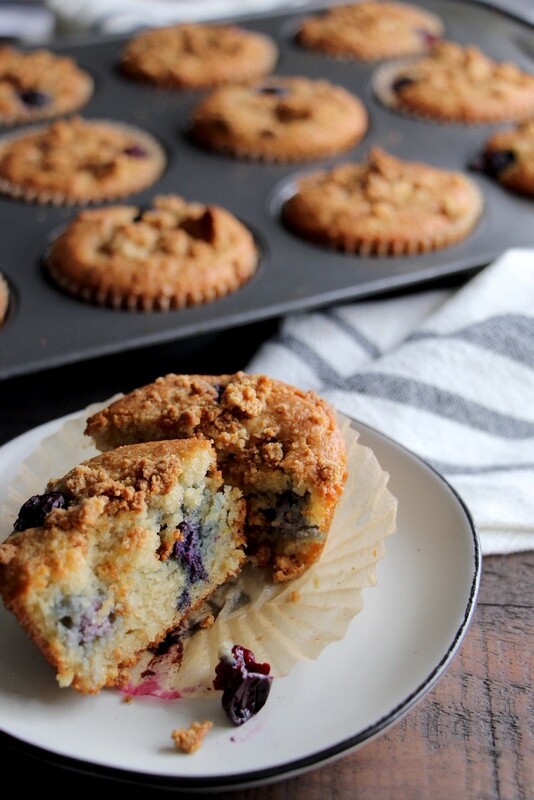 Sprinkle the streusel topping over the muffins. Bake for about 25 minutes, until the streusel is golden brown. Remove muffins from the tin, set on a rack and allow to cool completely.